On Friday night, the 2010 International Documentary Association (IDA) Documentary Awards were handed out at a ceremony at the Directors Guild of America in Los Angeles. Lucy Walker's Waste Land came away with the big prize, the Feature Documentary Award. It had been up against another art-themed nominee Exit Through The Gift Shop among others. 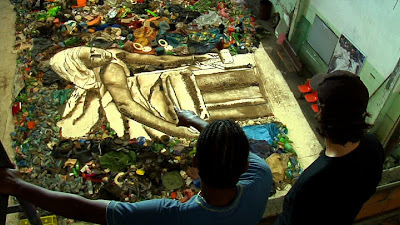 Waste Land also claimed the IDA Pare Lorentz Award which is given in honour of Lorentz's filmmaking legacy to a film that explores "one or more of Lorentz's central concerns – the appropriate use of the natural environment, justice for all and the illumination of pressing social problems." The IDA Pare Lorentz Award prize had been announced earlier in the week. Other award winners included For Once in My Life which took the IDA Music Documentary Award. Duane Baughman and Johnny O’Hara's excellent film Bhutto won the ABCNews Videosource Award. Presumed Guilty and The Oath tied for the IDA Humanitas Award. The Short Documentary Award was given to Woman Rebel. IDA's Career Achievement Award was given to multiple Oscar-winner Barbara Kopple. Jeff Malmberg received the Jacqueline Donnet Emerging Filmmaker Award. The team of Alan Raymond and Susan Raymond received the organization's Pioneer Award, while film professor Mark Jonathan Harris received the IDA Preservation and Scholarship Award,. The ceremony was hosted by documentarian Morgan Spurlock.